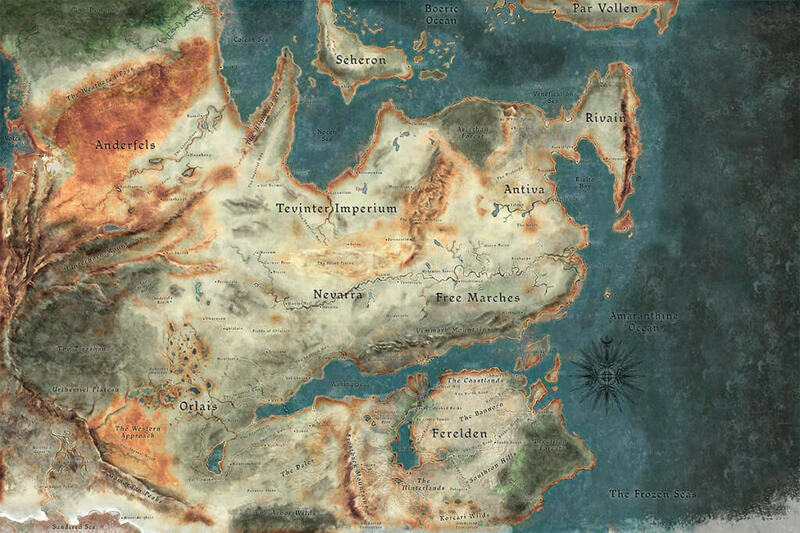 The Dragon Age series is set on the fictional continent of Thedas. There are 5 main races: The Qunari, Humans, Dwarves, Elves and Darkspawn. Humans are the most powerful race at the time of the games, with kingdoms spanning most of Thedas. The Qunari live to the north of Thedas across the ocean, while the dwarves are secluded in their underground cities, and the Elves are refugees and outcasts after the fall of their once-great civilization. The Darkspawn are a race of corrupted beings that live deep underground, and only emerge in giant hordes every few hundred years during a Blight. A Blight is a Darkspawn invasion of the surface world led by an Archdemon – an Old God in the form of a giant dragon. The Fifth Blight is the focus of Dragon Age: Origins. Another important element of the Dragon Age universe is the Fade – an otherworldly realm similar to an afterlife, inhabited by spirits of the dead, demons, and other metaphysical beings. Map of Thedas. Ferelden in the bottom was the setting of Dragon Age: Origins, while the Free Marches in the center were the setting of Dragon Age 2. Inquisition will reportedly take place throughout Thedas rather than one specific region. The Chantry – The Chantry is the leading human religious organization of Thedas, somewhat similar in power and beliefs to the Christian Church of Medieval Europe. The Chantry’s goal is to spread their faith to the entire world, including non-human races. The Circle of Magi – the ruling organization of mages in Thedas. The Circle trains new mages in the art of magic, particularly children who show magical ability. The Circle is controlled by the Chantry, and monitored by the Templars. The Templar Order – The Templars are a militant wing of the Chantry, who specialize at fighting magic. Their primary job is to oversee the Circle of Magi and to hunt rogue mages – those who refuse to be part of the Circle, and misuse their magic powers, usually by practicing blood magic. The Templars originate from the Inquisition formed after the First Blight. The Grey Wardens – An ancient order of warriors created to combat the Darkspawn, and the Blights in particular. The Wardens were essential in stopping every Blight. The Tevinter Imperium – the oldest state in Thedas, which once ruled most of the continent. The Tevinter Imperium is unique for its love of magic – their ruling body consists of Magisters, powerful mages that serve the even more poweful Imperial Archon mage. The Imperium has warred with the Qunari people to the North for centuries, which is largely responsible for their downfall as the ruling Empire of Thedas. Despite this however, they are still a force to be reckoned with. The Inquisition – Originally, the Inquisition was an organization formed following the First Blight. Their task was to defend people from rogue mages, cultists, heretics, and other dangerous groups which plunged Thedas into chaos. The Inquisition later transitioned into what is known today as the Templar Order, and the Seekers of Truth – two military arms of the Chantry. At the time of DA: Inquisition, this organization is being brought back for the purpose of bringing peace to Thedas, which is plunged into war and disorder following the events of Dragon Age 2. The player will lead this group as the Inquisitor. 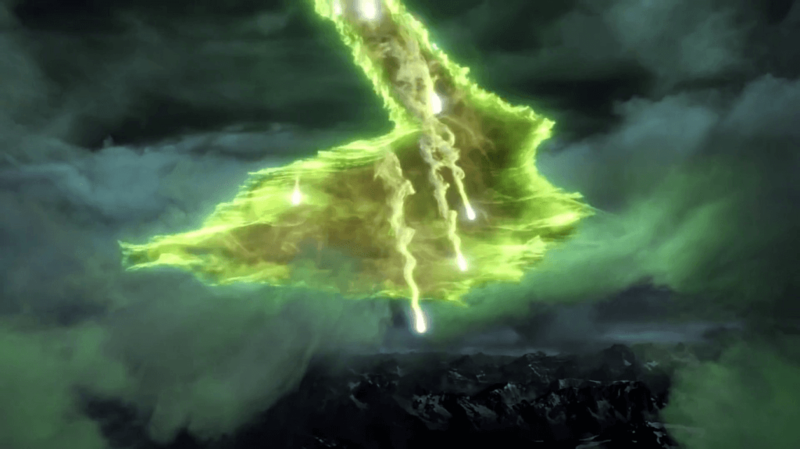 Dragon Age: Origins’ story revolves around the coming of the Fifth Blight which threatens to plunge Thedas into ruin. The Blight begins in the human kingdom of Ferelden. The player recruits companions and joins the Grey Wardens, ultimately defeating the Archdemon and stopping the Blight. Dragon Age 2 focuses on Hawke, a Ferelden refugee who flees the Blight that happened in the first game. Hawke arrives with his family in the city of Kirkwall, across the sea from Ferelden, in a region known as the Free Marches. The game chronicles Hawke’s rise to fame as he goes on dangerous adventures, saves the city from a Qunari threat, and ultimately takes part in in the Mage – Templar conflict which explodes into full out war by the end of the game. Inquisition builds on the events of the first two games as well as other content like books. Players will meet many old characters like Morrigan, Cullen, and Varric. Inquisition will not have one set location like Origins and DA 2, but instead take place all throughout Thedas in a large open-world environment. The Mage-Templar war is ongoing, and will likely play a key role. Another important conflict is the Orlesian civil war, which is described in the Dragon Age books. Orlais is the most powerful kingdom in Thedas. On top of all of this, the “Breach” in the Veil which separates Thedas and the Fade is pouring demons into the mortal world. The player assumes the role of the Inquisitor, whose role is to lead the group of companions known as the Inquisition to close the Breach and bring peace to Thedas. The Breach in the Veil.